Molecular dynamics (MD) and quantum mechanical calculations of the Cerulean green fluorescent protein (a variant of enhanced cyan fluorescent protein ECFP) at pH 5.0 and 8.0 are presented, addressing two questions arising from experimental results (Malo et al., Biochemistry 2007;46:9865–9873): the origin of the blue shift of absorption spectrum when the pH is decreased from 8.0 to 5.0, and the lateral chain orientation of the key residue Asp148. We demonstrate that the blue shift is reproduced assuming that a rotation around the single bond of the exocyclic ring of the chromophore takes place when the pH changes from 5.0 to 8.0. 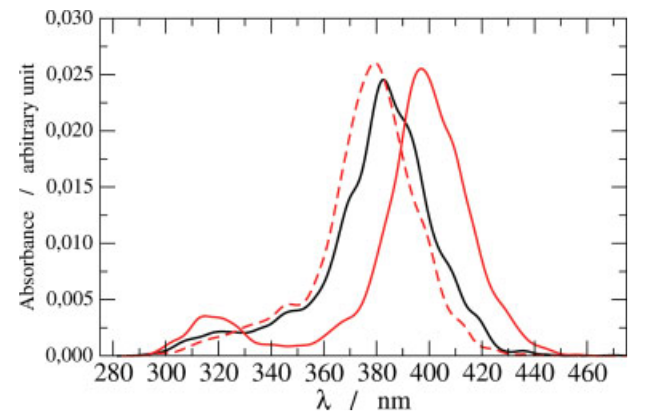 We find that Asp148 is protonated and inside the barrel at pH 5.0 in agreement with crystallographic data. However, the hydrogen bond pattern of Asp148 is different in simulations of the solvated protein and in the crystal structure. This difference is explained by a partial closing of the cleft between strands 6 and 7 in MD simulations. This study provides also a structure at pH 8.0: the Asp148 carboxylate group is exposed to the solvent and the chromophore is stabilized in the trans conformation by a tighter hydrogen bond network. This work gives some insight into the relationship between the pH and the chromophore conformation and suggests an interpretation of the very similar fluorescent properties of ECFP and ECFP/H148D.